Please click CONTACT button above and read answers to Frequently Asked Questions before Emailing or telephoning with orders or questions. To SEARCH (on this page): Press Ctrl + F keys (at same time), type item wanted in "Find" box. 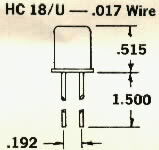 HC-33/U is wire lead version, (otherwise same size) soldered case like HC6/U. 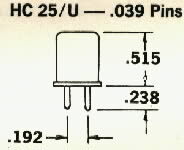 HC-48/U is welded case version of HC6/u (soldered case) crystal. 8+++MHz crystals: Synthesis=$12; and PLL (*=$15) (*includes HR2B=FreqX18 Ham 2 Meter transmit crystals). 12+++MHz synthesis crystals: ($12) (*=$15) includes HRT2 FreqX12 2-Meter Ham transmit crystals). 28.615=F-1R, 28.625=F-2R, F20S-3R=28.635=F-3R, 28.655=F-4R, 28.665=F-5R, 28.675=F-6R, 28.685=F-7R, 28.705=F-8R, 28.715=F-9R, 28.725=F-10R, 28.735=F-11R, 28.745, 28.755=F-12R 28.765=F-13R, 28.775=F-14R, 28.785=F-15R, 28.795 28.805=F-16R, 28.815=F-17R, 28.825=F-18R, *28.835=F-19R, 28.845, 28.855=F-20R, 28.865=F-21R, 28.875=F-22R, *28.885=F-24R *28.895=F-25R 28.905=F-23R, *28.915=F-26R, *28.935-F-28R, *28.945=F-29R. *28.955=F-30R. *28.965=F-31R. *28.985=F-33R. *29.025=F-37R. *29.035=F-38R. *29.045=F-39R. Tech Tip: Fundamental vs. Overtone Most crystals are cut by the manufacturer with a fundamental frequency below 20MHz because higher frequencies would make them so thin that they would be extremely fragile! Most crystals below 20MHz are labeled at the "fundamental" frequency. Some about-13mHz crystals are labeled with the "fundamental" frequency but are used at the "2nd overtone" in a tuned (CB) circuit. Most common crystals for CB & HF amatuer applications are labeled at the "3rd overtone." Many crystals labeled from 23 to 54MHz are cut with a "fundamental" that is 1/3 of the (labeled) operating frequency. The tuned circuit on the output of the oscillator determins the output frequency. Example: a crystal labeled 12.190MHz could be used at 12.190mHz or 36.570mHz; a crystal labeled 36.570mHz could also be used at 12.190mHz! Crystals for Amateur VHF (High Band aproximately 150mHz) applications are typically used in an oscillator plus a "multiplier" circuit for higher multiples of that first oscillator. Example--many old Amateur/ham 2 Meter transmitters use crystals cut for use in an oscillator that is 1/9th or 1/12th or 1/18th or 1/24th of the operating frequency! see our RED BOOK OF CB MODIFICATION & REPAIR for information about CB crystal synthesis circuits. Revised December 2014 kt; Copyright © 1997 Fernando Lezica, All Rights Reserved.